Greenland’s coastline is anything but smooth. It is punctuated by rocky outcrops and ice-choked fjords, the outlets through which ice from the interior drains into the sea. The myriad “marine-terminating outlet glaciers” along the coast of Prudhoe Land in northwest Greenland may not be the country’s largest, but they are retreating fast. 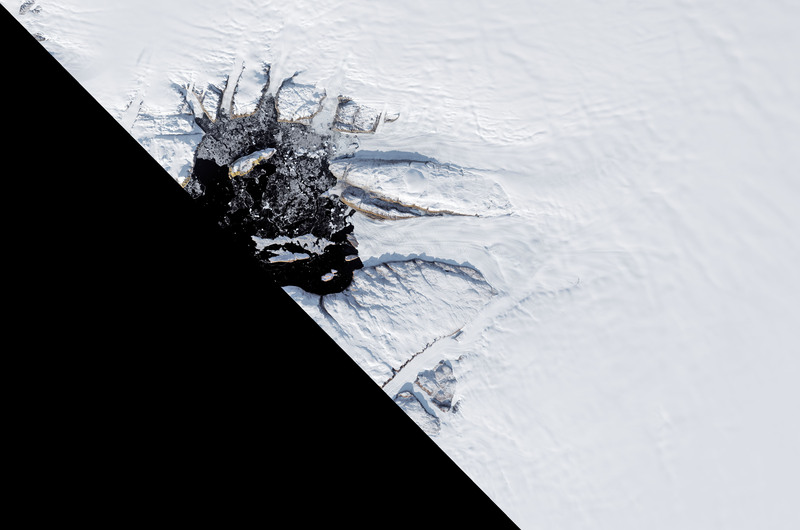 This image pair shows changes to two of the more prominent glaciers in this region. 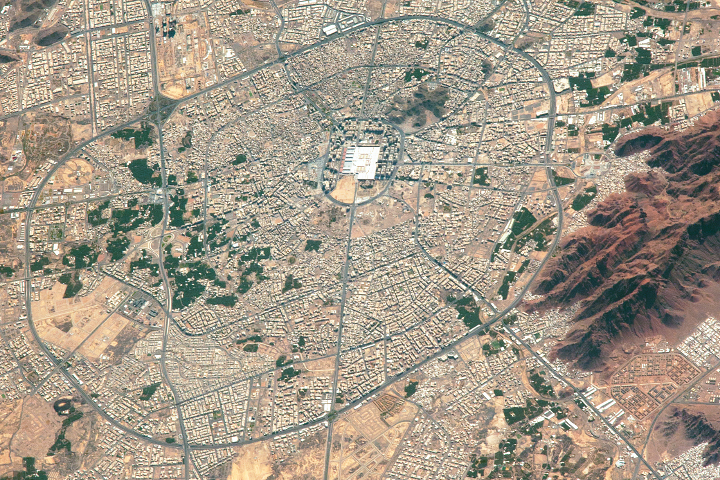 The first was acquired on September 28, 1987, by the Thematic Mapper on Landsat 5; the second was acquired on September 30, 2017, by the Operational Land Imager (OLI) on Landsat 8. 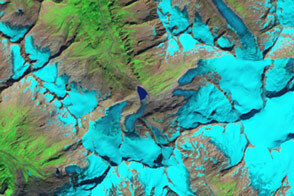 Tracy Glacier (north) and Heilprin Glacier (south) are the largest glaciers draining into Inglefield Bredning, a fjord measuring about 20 kilometers (12 miles) wide. 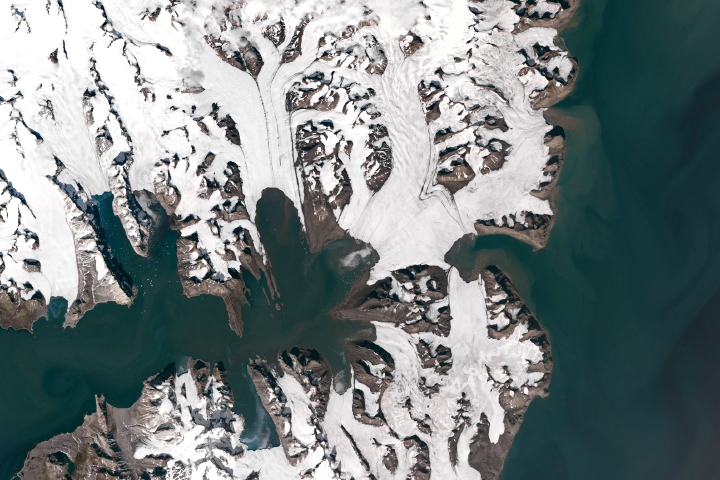 According to research published in 2018, scientists found that glaciers in this region have retreated significantly in the 21st century due to atmospheric warming. 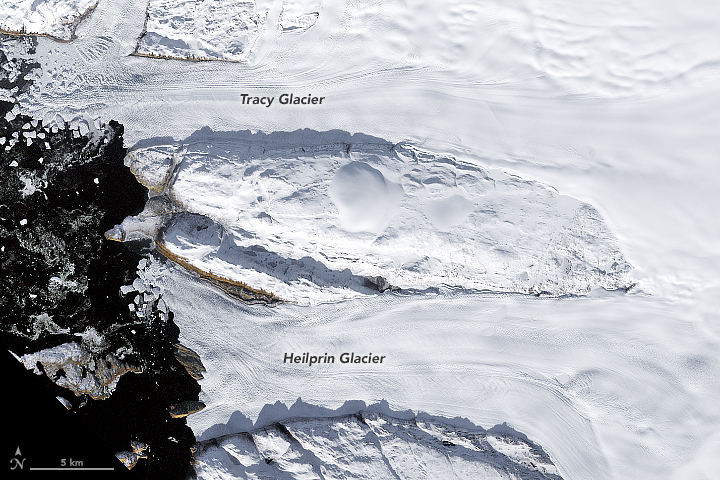 From the 1980s through the 1990s, Tracy and Heilprin glaciers retreated at similar rates, about 38 and 36 meters per year, respectively. But between 2000 and 2014, their rates of retreat diverged dramatically. 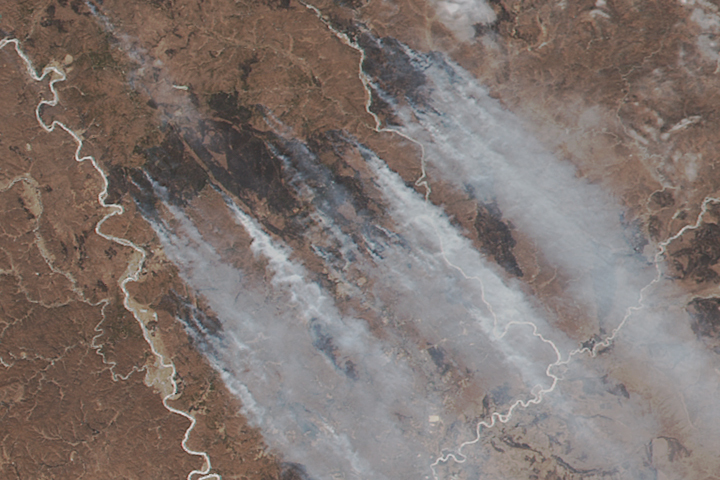 Tracy retreated by 364 meters per year. That is more than three times the rate of retreat at Heilprin, which lost 109 meters per year over the same span. 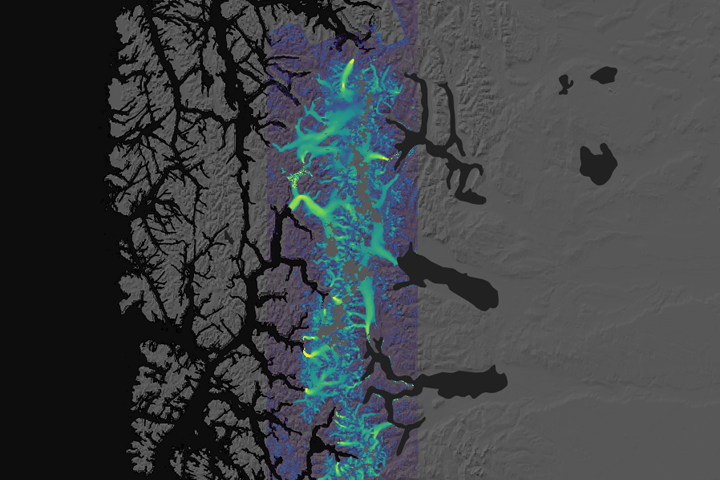 The difference is likely due to the way the glaciers encounter water. 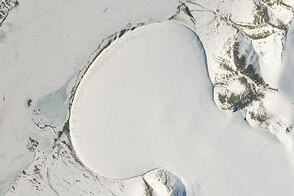 Tracy Glacier flows into a deep channel of seawater (as much as 600 meters deep), making it more vulnerable to melting from below by ever-warming seawater. Heilprin, in contrast, flows into shallower water and is not thinning or retreating as quickly. NASA’s ship-based Oceans Melting Greenland (OMG) field campaign has been studying the role of the oceans in the melting Greenland’s ice. 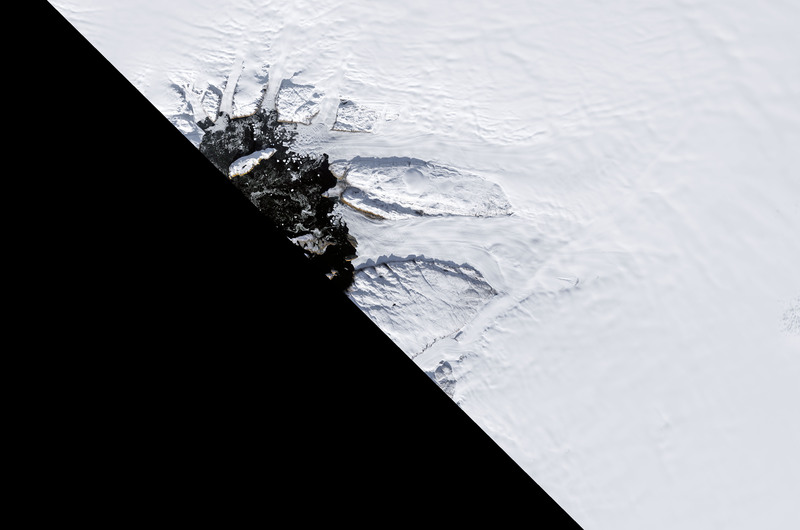 At the same time, Heilprin and Tracy glaciers are among those mapped each year by NASA’s Operation IceBridge, an airborne mission to map polar ice. During the 2011 IceBridge campaign, scientist Michael Studinger snapped this photograph of Tracy Glacier. 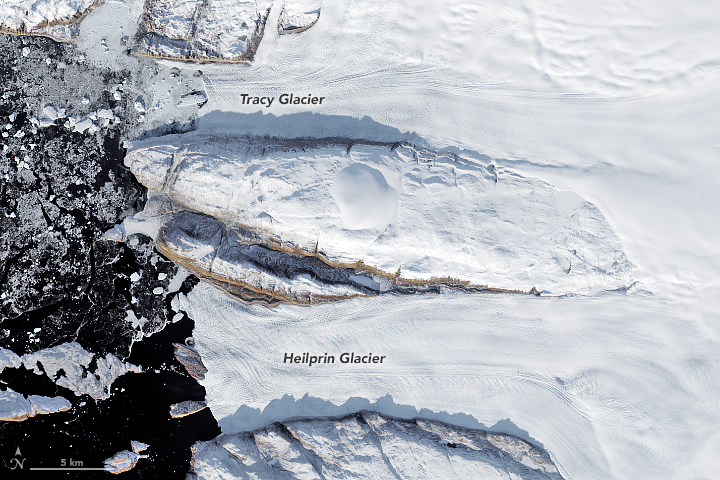 The Tracy and Heilprin Glaciers may not be Greenland’s largest, but they are retreating fast. From a Glacier’s Perspective blog, via American Geophysical Union (2018, March 22) Heilprin Glacier, NW Greenland Pinning Point Decline 1987–2017. Accessed April 6, 2018. Sakakibara, D. and Sugiyama, S. (2018) Ice front and flow speed variations of marine-terminating outlet glaciers along the coast of Prudhoe Land, northwestern Greenland. Journal of Glaciology, 1–11.